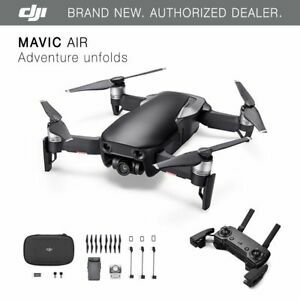 Details about DJI Mavic Air - Onyx Black Drone - 4K Camera, 32MP Sphere Panoramas! Very pleased! Thanks for a great item. Item was exactly as described. Ultra fast shipping. Very pleased! Seller came in clutch when BEST BUY wouldnt! Package Came fine, after 4 flights with mavic air battery started swollen. Super drone, thank you for prompt delivery! Beware! Fungus infected product! Worst Horrible Customer Service! Best Drone Ever - great features and amazing quality! Great features with my top priority of full obstacle avoidance to allow you to fly almost anywhere without the fear of damaging your quadcopter. Comes with extended camera options to provide amazing photos and videos. This drone is not a toy but a quality unit from its 3-axis camera control to its six additional cameras to provide for complete obstacle avoidance. Once you own a DJI product and see and feel the quality, you will become a believer...they are #1 for a reason! This quad is the best quad i have, really smart, really impressive ! First time user but I thought the Magic Air was easy to learn with. It does some awesome things. Glad I didn’t get a cheaper one for starting the sport.